PRIMO is in the Machine building business for Welding Automation since 1995. PRIMO has recently expended its Robotic Welding job work Services specifically for those customers who cannot invest immediately for a new capital machinery such as Robotic cells. Hence we are willing to spare our already invested infrastructure to get utilized and also to benefit the customer. Upon continuous working we can ourselves offer you a comprehensive complete set of Robotic cells from our Machine building division. We have a specially built 9 Axes Robot Configuration as well as a 6 Axis Welding Robot to cater to the various demands of Highly Accuracy and repeatability. We currently Undertake Job work for Robotic Welding Services on special Jobs from various customer segments. 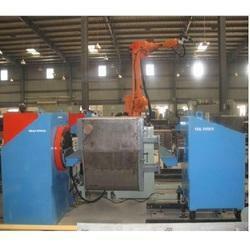 Please contact us to discuss about your Robotic Welding Services requirement. "PRIMO" has delivered its State of the Art Robotic solutions to Various Customers in Automobile Field for the Heavy Welding segments. This Robotic Cell comprises of Dual Robot Dual Station concept for reducing the cycle time and in turn Productivity. PRIMO has executed and supplied countless Robotic solution to Various industrial segments such as Automotive, Valve Industry, Railways, Heavy Engineering segments. Our Robotic - Diesel Tank Welding has delivered its State of the Art Robotic solutions to Various Customers in Automobile Field for the Heavy Welding segments. This Robotic Cell comprises of Single Robot Doing Complete Welding of Diesel Tank both Internally and Externally. 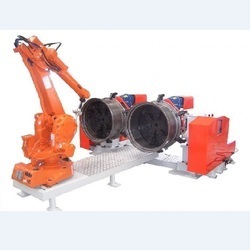 Robots are synchronised with external axis to maintain Weld bead quality at all places. Looking for Robotic Welding Job Work & services ?